Structure rigidity is absolutely essential to ensure reliability and durability of a folding machine. The stress put on the machine, especially at the extremities, is very high and often such as to damage it prematurely. This is why the robustness of the Celli frame is so important, as it preserves the machine over time. Each folding machine consists of two side frames and a central frame, the robustness of which is in proportion to the model used. The side frames are supported by the central frame using large diameter pins that are coupled with cemented and hardened bushes. The absence of space between the two frames of the two machines represents an important technical feature of Celli tilling machines and folding Frangors. Celli solved the issue by eliminating all the space in the center and keeping the two machines very close together perfectly in line. This is possible thanks to the particular design of the side and central frames, as well as to the creation of special rotors. This concept concerns machines that have been designed with ample space between the frame and the working parts (blades or tines or teeth). 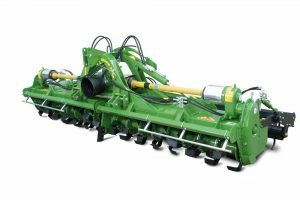 The maximum volume in the working area under the machine is guaranteed, thus avoiding the risk of clogging that can be created by working on heavy soil or with the presence of abundant crop residue. This arrangement obtains high feed rates and greater working depths, resulting in high hourly productivity. The TIGER models apply this concept in their design. The technical solution adopted by Celli guarantees an adequate gear ratio without overloading the lateral drive shafts: the central gearbox acts as a bevel gearbox while the reduction takes place in the side gearboxes. A further reduction then takes place, as always, in the lateral transmission cascade gearbox. They ensure optimal machine leveling and correct "floating" even in light ground conditions. They are constructed using thick pipes to which high quality steel flanges are welded. They are optimized based on the automatic welding cycles performed as the best compromise between material hardness and impact resistance. The rotor is provided with the ends of the blades facing inwards. Squared and curved blades can be mounted. They are constructed using thick pipes to which special wear resistant (straight tine type) or forged support (tooth type) steel flanges are welded, based on the automatic welding cycles performed. The rotor blade holders are optimized to provide the best compromise between material hardness and shock resistance. Two different types of Frangor rotors are available: toothed or straight tine. Toothed rotors are versatile and work well in dry, hard and wet soil conditions. Stones pose no threat and this rotor normally guarantees lower power absorption, compared to a straight tine rotor. The rotor with straight tines is recommended when the maximum soil refinement is necessary. Works best in dry soil conditions. When choosing a Frangor machine equipped with a straight tine rotor, power requirements must always be taken into consideration in order to avoid an excessive working width. The shape of the rotor blade holder, assembly sequence of the respective tools, blades and teeth/tines, as well as their technical features, help reduce power absorption and vibration, allowing the machine to run smoothly. Versatility is this product’s main feature. It operates smoothly both in heavy soil conditions and in hard and dry terrain. The various adjustments and design features available allow fast adaptation to extreme operating conditions. Machines equipped with toothed rotors can work in dry, hard and wet conditions without any risk of clogging. Stones present no threat to these machines and they guarantee a good degree of soil refinement with reduced power absorption. All the machines are equipped with lateral gearboxes with 2 rotation speeds. A speed is already set in the gearbox, while the other is quickly obtainable by simply inverting the gears. A main gearbox oil cooling system is available on a number of models in the Celli product range. This is a particularly useful accessory when the equipment is used for long periods of time in harsh conditions. The presence of an oil filter guarantees the elimination of impurities during the breaking-in phase, which lengthens the life of bearings and gears. Machine setting, as well as opening and closing operations are quick: everything can be done from the tractor cabin. Reasonable weights must not be exceeded in order to prevent dangerous situations while transporting on roads, especially in the case of larger machines. Keeping this in mind, high quality materials with optimized dimensions are key to ensure machine resistance that does not affect weight. The machines are lifted using very robust jacks equipped with lock valves. Once closed, they are locked using safety hooks A mechanical manual lock may also be applied as an additional safety precaution before transport. The wide range of available solutions makes it possible to identify the ideal machine for any type of use, always maintaining hourly productivity at the highest levels in relation to the available power ranges. The Celli range of tilling machines and folding Frangors provides the largest selection available on the market today.